Making city travel easier by gathering and disseminating information from mobile devices. On March 23rd 2013 a lorry got stuck in London’s Queensway tunnel, which takes large flows of traffic underneath the Strand, to and from Waterloo Bridge. The tunnel was closed in both directions. Traffic quickly built up and started to overflow into surrounding, narrow streets, to find a way around. Those streets quickly became impassable. Without warning, cars travelling routes nowhere near the tunnel got caught up in the gridlock. It took two hours to travel less than a mile. Jams such as this are a part of city life – what makes it so exciting, unpredictable and infuriating. 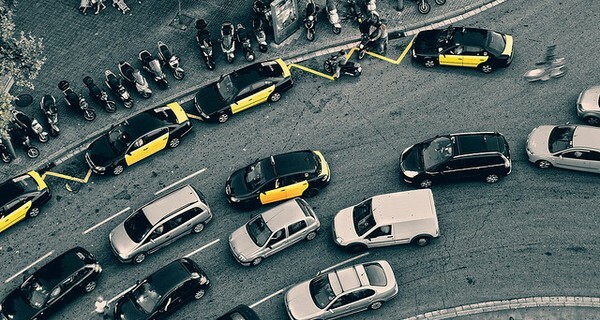 Long seen as the price of living in a city, the collective chaos and frustration of traffic jams could become more easily avoidable thanks to a clever system to allow us to make better collective decisions about how we get from A to B. The system Bitcarrier gathers its information about how we are moving around a city – travel time, average speed, traffic volumes – by using the public frequencies from mobile devices that we carry. It analyses and then visualises that data in three main forms to allow people to make better informed decisions. Pathsolver, is a guide for pedestrians to plan their best walking routes, especially through busy areas, for example, in rush hour or when there are big events. The system has been used in large museums, such as the Louvre in Paris, to understand and plan people flows in big exhibitions. Roadsolver is for car drivers, so they can get more accurate, real-time information about traffic and routes, to plan the most effective way through a city. But the most important application in the long run could be Citysolver, which provides data for city transport managers and planners, to allow them to adjust traffic light signals, plan roadworks and even to plan the creation of new capacity. Most of our traffic infrastructure is used only at peak times, in the morning and the afternoon, when it is often strained to breaking point. Better information – and road pricing – could lead to more intelligent and effective use of the infrastructure we already have rather than us needing to build more. Improved information, gathered from all of us, should allow better collective decisions about how to use our shared transport infrastructure more efficiently. Since our first discovering BitCarrier in 2013, they have now achieved an 'exit', being bought by WorldSensing, a smart cities infrastructure firm, in February 2014.